Death Of The High Street or Revival Of The Fittest? We hear all this talk from politicians about the “Death of the High Street”, we see empty shops all around our town centres. Every day we hear about a business going bust – in fact, all of us probably know first hand or a friend of a friend someone who has lost their business in the past 2 years. 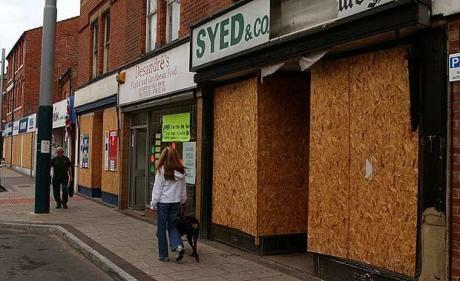 But here in Stoke On Trent, a deprived city at the best of times, we are bucking the trend. Literally, we have got businesses fighting over empty commercial space! Last night was a prime example – it all kicked off at 5pm when I informed the business who had put in an offer for the commercial space earlier that day, that his offer had been exceeded. He went crazy. Literally mental down the phone at me. He was going to pay more, he was going to pay 12 months rent now, he was going to give double the deposit. He was having that commercial space. He was determined. He was adamant. And he demanded I remain at the office, while he gave me a huge amount of money and completed the paperwork on a 15 year lease! And that’s not the first time in the past few weeks that that’s happened! In the past few weeks we’ve let commercial space which will be used for a variety of different businesses from a trophy shop to a barbers, a vintage crockery shop, an off-licence to a bridal/ prom dress shop. Admittedly, before we took over the marketing and management of these commercial units they had been empty for years. Why is it different now? Well to be honest, the landlords are now with an agent who cares. An agency who believes that the entrepreneurial spirit is alive and kicking and who helps businesses to open their first, second, third premise and who actually tries to help. And so personally, I blame the agents for all the empty commercial space on our high streets. Most commercial properties are looked after by the big corporates, the chartered surveying firms – and it languishes on their books. The corporate commercial agencies don’t have the entrepreneurial flair that we have – they don’t need to have – they are already the big players. My belief is that you need to think about the whole food chain – not just the top end. So next time you’re down the high street and you see an empty commercial property don’t just think about the business failure that was there – think about what could be, what what be – if only they had a decent agency. And if I haven’t harped on enough about our success –here\’s us in the local paper this week with a lovely article for a business we helped move into an empty commercial premise. Looking For A Job In Property? Apply Here! Hi. Love the idea you have and it’s true that if these shops had a better platform to promote themselves then they would have a better chance of success. That’s one of the reasons we started Vouchers4. It’s a Media company based in Bournemouth, keyed to helping small shops and business, find local customers and to find them, they give offers and incentives. I’m on a mission to help the shops make a come back, as I’m kinda fed up with Charity and 99p shops only. Great article. Good to hear and good for you. Say hi.